Salvagers are hoping to reduce the list of a ferry which ran aground off the Blackpool coast last week. 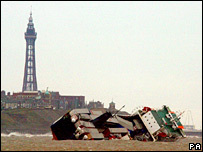 The Riverdance has been stuck on the sands off the Lancashire resort since Thursday and salvage experts think it may be a week before it is moved. In the meantime they hope to reduce its 60-degree list by pumping water into the empty ballast tanks and removing the fuel from the ferry's tanks. The last of the crew were winched off the ferry on Friday. The Riverdance had been heading from Warrenpoint, County Down, to Heysham, Lancashire, when it was hit by a freak wave. Twenty-three people were lifted to safety that night. Thousands of packets of biscuits being carried on board have been washed up on the shore. Hugh Shaw, the government's representative for maritime salvage, said bad weather had hampered the recovery operation over the weekend. But he said it was hoped a system of pipes could be set up on Monday to pump water into the ballast tanks. "The priority is still to get the fuel oil out from the bunker tanks," he added. 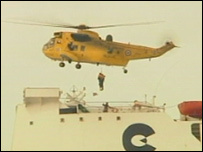 A salvage team winched aboard the ferry on Saturday reported that the vessel was "intact". They returned on Sunday and Mr Shaw said they had managed to "do a little bit more work". He said: "It is extremely dangerous for them on board with all that listing. "A lot of the trailers have shifted so there is concern, but they are still trying to do the best they can with the vessel. "I think the weather has been unkind from the start of the operation - I don't think we're going to see a break for the next few days." He said he thought it would be a week, rather than a few days, before the Riverdance, which is owned by Seatruck Ferries, could be moved. An exclusion zone of 400m is in place around the ferry and part of the esplanade is closed.